The much awaited update for the Google maps, Android version is here. 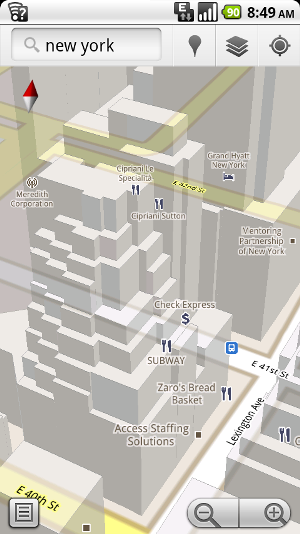 Now the Google Maps 5 (GM5) has 3D maps and offline navigation. 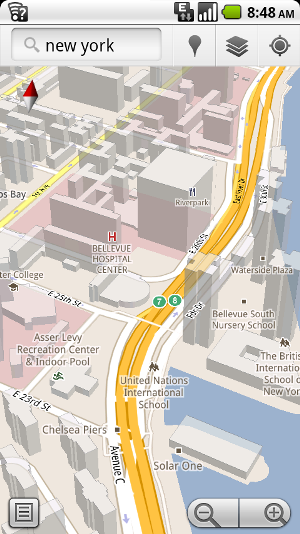 3D maps are not available in all countries yet, but its a big leap forward. Its available only in about 100+ city as of now. But it makes all other map applications look nooby. All you have to do is to swipe two fingers from top to bottom of the maps, and voila: 3D maps.The zooming and scrolling is much smoother, thanks to the vector maps. The compass mode is another notable feature. Tapping on the compass button activates this mode and interfaces the maps with the digital compass to give real time orientation and direction in 3D. Offline navigation is a welcome feature. Imagine you are planning a trekking trip and you don’t get mobile or wi-fi signals in the location, but if your maps are already cached, the navigation still works and also guides you appropriately. You will need Android 1.6 or higher to experience GM5. But 2.0+ is recommended. The experience is supported fully in a few devices and partially in many devices. Check the official google maps site for more details on compatibility and feature availability at your region.